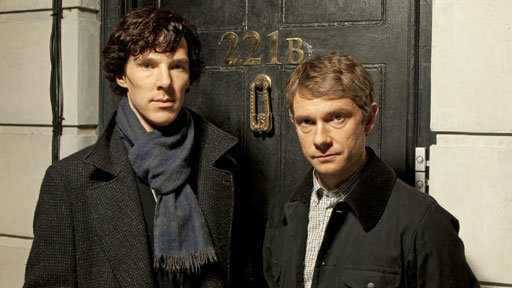 Moffat and Gatiss have written a modern day Sherlock Holmes series (titled Sherlock) for the BBC that will air this Sunday. Starring Benedict Cumberbatch and Martin Freeman. Knee-jerk reaction might be "mistake" but I'm betting they will settle into a groove. Scotsman Steven Moffat is a known quantity in nerdland (saying that lovingly) having written extensively for the revived Dr. Who and also worked on the script of upcoming Tintin. Snippet interviews w/ Moffat/Gatiss. Some 221B shots too.